with the NFL is to make Game Day Awesomer. 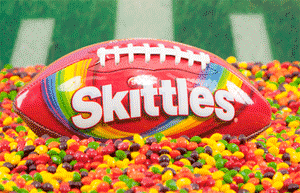 The Skittles site is full with weird stuff and Skittles already had some nice exposure at the Super Bowl last year through Marshawn Lynch. He had some Skittles during the game and is supposed to be a big Skittles fan. Skittles runs currently very weird ads that raise hopes that the Skittle Super Bowl 2015 ad will make Super Bowl ads awesomer! The Skittles ad star Skittle Clouds as pets. The Super Bowl 2015 takes place on February 1st in Arizona. Super Bowl Ads For Geeks will report and publish all Super Bowl Ads of 2015 in collaboration with I4U News.